Would you like to share videos on YouTube without having other distracting thumbnails display? Use this neat trick: In the URL, insert “_popup” between watch and ? Now your video takes up the entire screen and there is nothing else to click on. Another alternative to this is to post your link in viewpure.com, which will clean up distracting videos and give you an alternative URL automatically. The video I watched just ended, but then another one started playing right after! This one is actually really easy to fix. By default, as I’m sure you’ve noticed, videos will keep playing regardless of whether you want them to on YouTube. Let’s change that! This is the default. 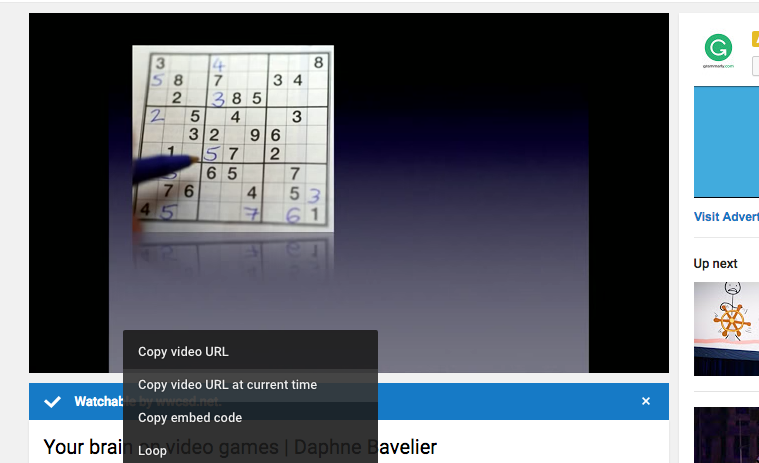 You can tell Autoplay is turned on. Just click the blue checkbox and you can turn autoplay to OFF. You’ll find these options above the video thumbnails on the right of the main video, above all the suggested thumbnails listed. So you want to start your video at a specific time? This is an easy thing to do once you know how. If you right-click anywhere in the video at the time you want the video to start you’ll see the option Copy video URL at current time. This is all there is to getting your link to automatically play at that time you clicked… You’ll know it’s right because it will give a t=(your time) attached to the video link! I don’t want any thumbnails of suggested videos to show up after my video plays! Sick of having suggested videos display as soon as your video is finished playing? Come to think of it, viewpure.com is probably your best bet for cleaning up your video content altogether because it removes suggested videos from the sidebar AND the video itself. If you’d like to have a video repeat itself by default, you can do this by changing one word in the link. This is YouTube to YouRepeat in the link. Just so you know… this method brings up another website with a different background from the normal white background. Yes, you could use YouTube’s embed option but I’ve noticed that scaling can be a major issue when viewing a website with a video from a Smartphone vs. a Computer. Check out this website instead. http://embedresponsively.com/ as it gives you a different kind of embed code based on % instead of pixels.